This summer, the European Street Design Challenge focused on Bondy, with its rich diversity of cultural, environmental, demographic and architectural perspectives. The challenge in Bondy was to create new and innovative connections across this diversity, in order to improve community cohesion and inclusion, creativity and quality of life. 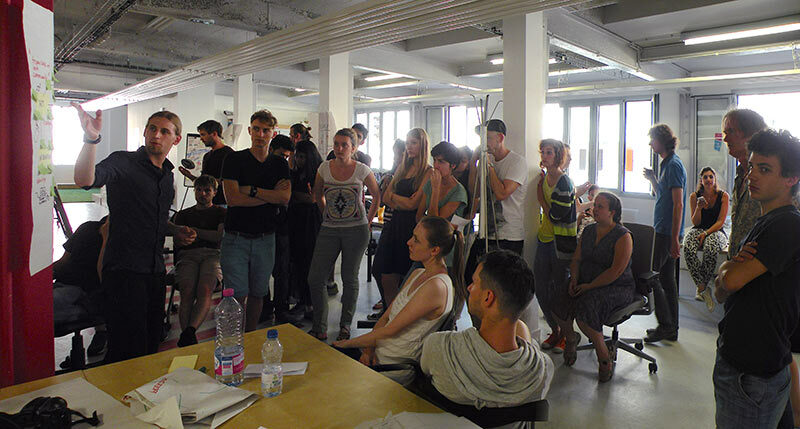 In the months leading to the European Street Design Challenge, which took place during the international Futur en Seine festival from 11th to 15th June, Creative Cooperative worked together with representatives from the Conseil Général of Seine-Saint-Denis, the Mairie of Bondy, local representatives and residents, supported by design students from Strate School of Design, in order to “map” the area, in all its complexity, in before the arrival of the competing design teams. 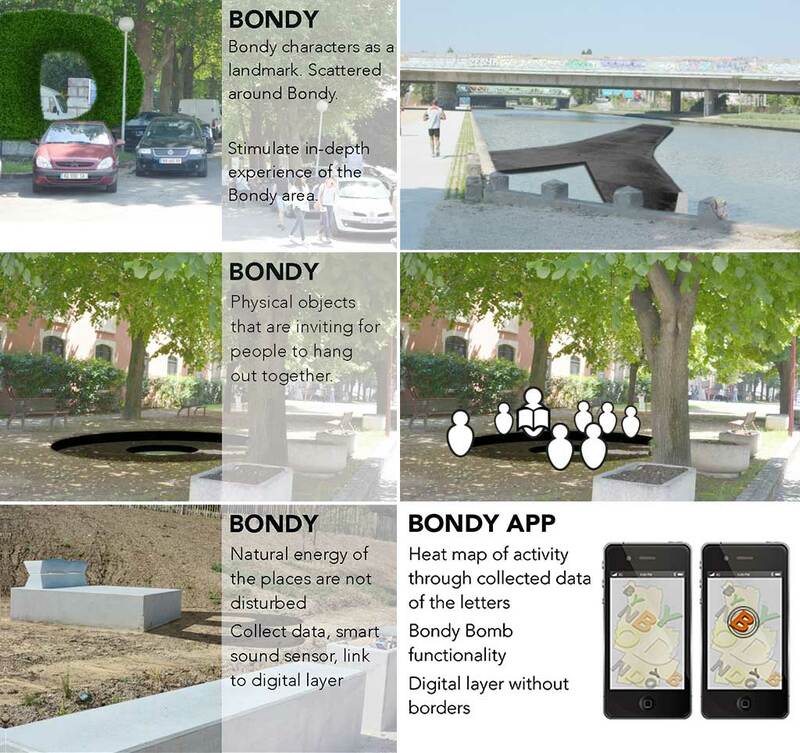 In advance of the European Street Design Challenge 2014, a team of students from Strate School of Design – Arthur Dinant, Charlotte Boucier, Julien Cochard, Louis Massuel and Laure-Anne Pennaneac’h – took on the role of “embedded” designers for the Bondy redesign. They visited the town on several occasions, produced their own emotional maps of the area, carried out benchmarks and urban analyses, made proposals for the target design areas, designed their own co-creation tools and carried out interviews with local residents and associations. Bondy is a “commune” or town in Seine-Saint-Denis to the north east of Paris, some ten kilometres from the centre of the French capital. Bondy has a long history, marked towards the end of the 20th century by the influx of many low-income and immigrant families. 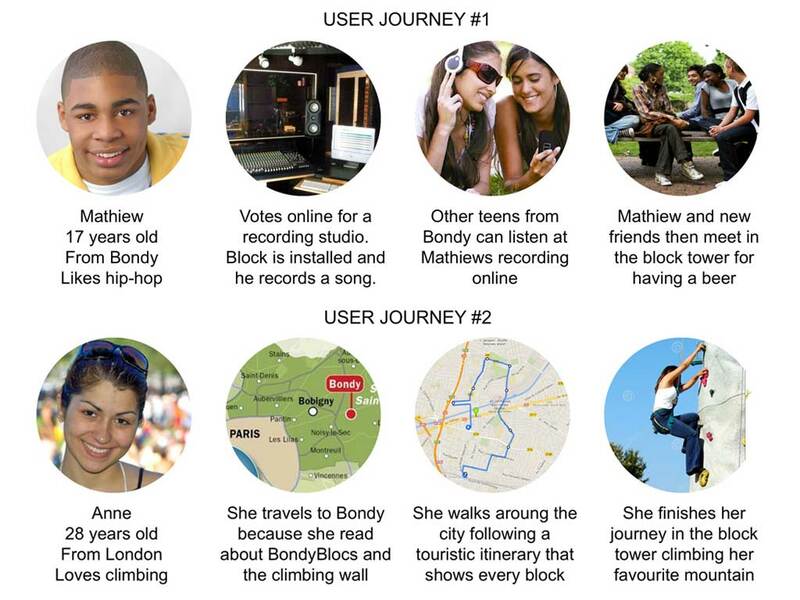 Today, the population of Bondy reflects a very wide multi-cultural spectrum. Bondy is an interesting mix of traditional industrial and residential architectural fabric, together with new commercial and high-rise residential areas. This urban mix often presents some very diverse perspectives: An almost “village” rural atmosphere – with the old central church, peaceful canal banks, and traditional French villas – stands in sharp contract with the hectic main highways, lined with busy commercial centres. Bondy has a strong cultural focus, and is the home of the internationally known “Bondy Blog”, created by a group of Swiss journalists during the suburban riots of 2005, and subsequently the inspiration for many young French, immigrant and foreign journalists in the area. Bondy is also the home of the internationally renowned “Instititut de recherche pour le développement” (Institute for Development Research), and, through its “popular university”, the town offers free courses to all inhabitants in courses ranging from “art and nature” to “architecture and urbanism”. Since 2006, Bondy has seen the start of many urban regeneration projects, with strong local government support. Under the leadership of Marion Unal, the Deputy Mayor responsible for Urban Renovation, the town of Bondy is now in the midst of an ambitious PRU (Programme de Rénovation Urbaine) with dynamic and innovative development in several target areas. These projects include not only the redesign of urban housing and residential areas, but also the development of “eco-districts”, the creation of recreational facilities, and participative cultural and educational activities. Bondy is a commune in a state of dynamic development. The provision of adequate and attractive housing for a rapidly expanding and diverse community is a priority, in addition to cultural and social initiatives, aimed at promoting civic cohesion and wellbeing. This development is clearly driven forward by an inventive and committed town hall and strong support from the Conseil Général of Seine-Saint-Denis. 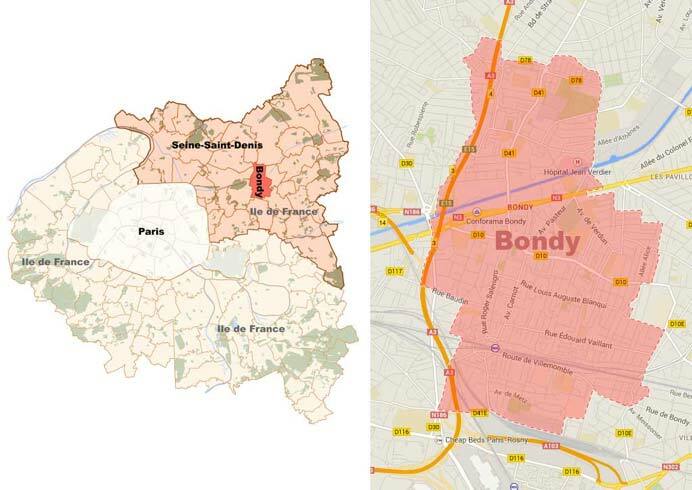 Bondy remains, however, a “Zone Humaine Sensible” (a sensitive, delicate and complex human area) due to such factors as its geographic position, history, diverse demography, and relative poverty. Questions such as community identity, empowerment, civic engagement and sense of belonging are complex and challenging. Following are some “challenges” which were noted in advance of the European Street Design Challenge. The clear split between “North” and “South” Bondy is mentioned by everyone, from whichever “side of the canal”. First, there is the social and economic divide – Bondy North is poorer, with high density social housing, and perceived as being more “dangerous”. 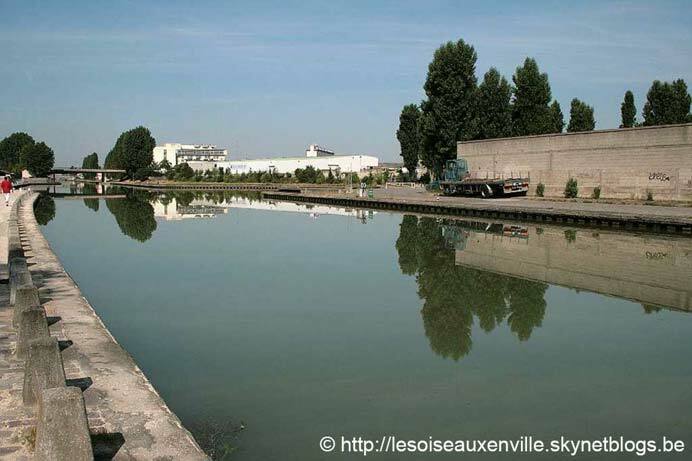 This social gap is then exacerbated by the physical divide between north and south – the Canal de l’Ourcq and busy RN3 form a physical barrier between the areas in the north and southern Bondy, with its old town centre, mairie and railway station. 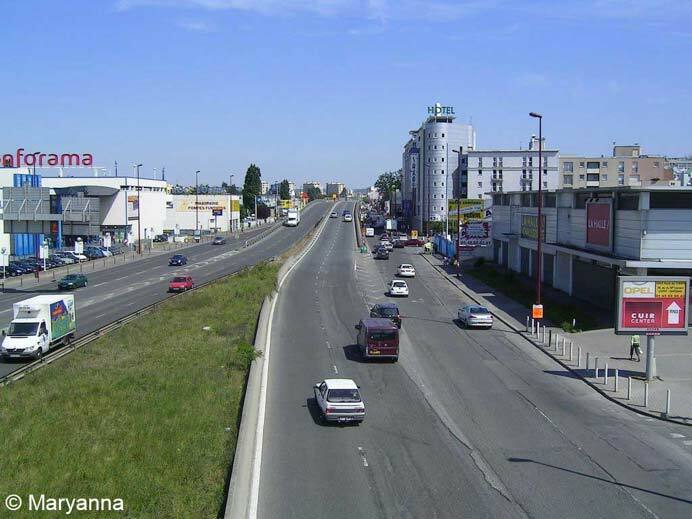 The future main traffic hub of Pont de Bondy, which lies between north and south, is perceived as a dangerous “concrete jungle”, and not an as an attractive route for pedestrians to pass from north to south. It seems to be imperative to change the mental profiles and prejudices which citizens of Bondy may have with regard to their “northern” or “southern’ counterparts – “those in the south have everything”, “the north is unsafe” etc. The bridges in Bondy are seen as making a physical link, but perhaps not succeeding in creating a “mental or emotional” connection between the two communities. This feeling of division, and perhaps also inequality, between “us” and “them” is also highlighted by the location of the IRD, an old, acclaimed international Institute, situated in parkland directly next to the cités of the north, but clearly separated and “protected” from its new residential neighbours by forbidding barriers and walls. We heard the anecdote of the resident of one of the northern cités who has lived for years next to the IRD, but only discovered “what it is and does” and its international significance, on a visit to Mali! Interestingly enough, the “independent” Mosque at the Pont de Bondy does not seem to suffer from the divide, but rather unites muslims from both sides of Bondy, in addition to their neighbours from Bobigny. In the same way, observation of the Roman Catholic congregation in the town centre church seemed to confirm the inference that religious gatherings were one factor in uniting residents from both sides of the town. 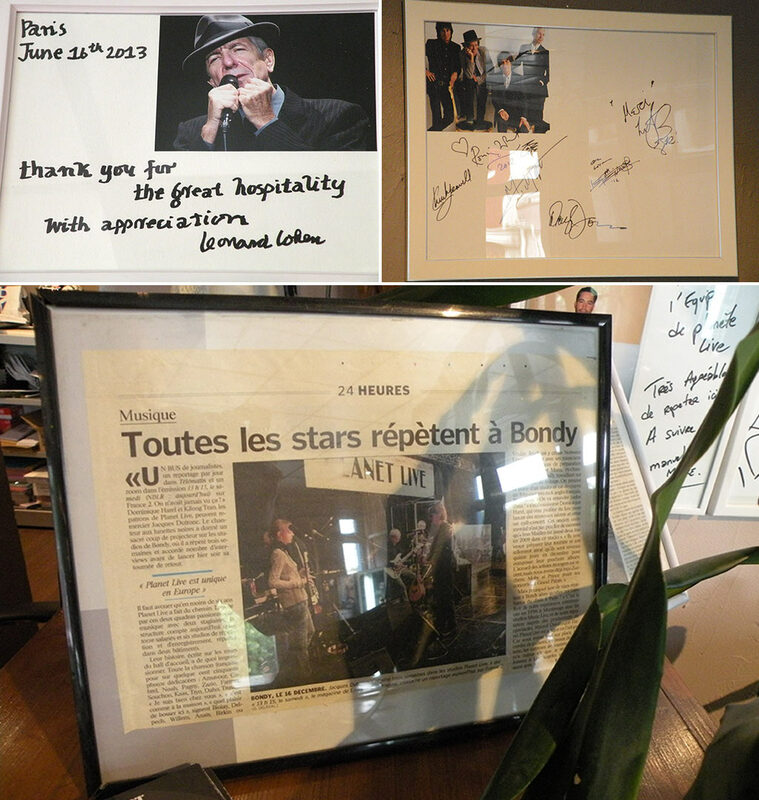 Certain musical events in the past have also succeeded in bringing people in Bondy together, and even attracting Parisians into the area. Probably the most famous of these events was the internationally famous “Il y a de la banlieue dans l’air” festival which started in the 80s and featured such artists as IAM, NTM, La Mano Negra and Khaled. The festival closed due to lack of funding in 2009. Rap, hip-hop and other such musical genres remain intensely popular pastimes – and potential “paths to success” for many of the youth, particular young men in the northern cités. 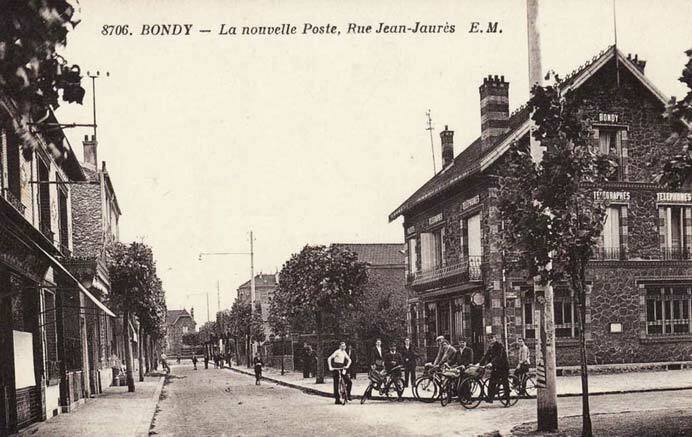 Those who have no particular allegiance to Bondy, but regard the area as a cheap place to live and sleep close to Paris – RER, Boulot, Bobo (“travel, work, sleep”). In some ways, ownership is related to the sense of belonging. Particularly in the new northern cités, the balance between ownership, rules, regulations and preservation is complex. The Aulnay park presents a good example of this tension. This attractive park, bordering on the cité and the IRD, was initially apparently very popular with local residents – 5000 locals were present for the inauguration – but has since lost some of this attraction, because of the regulations restricting certain “freedoms” – no barbecues, picnics, football etc. It is clearly difficult to preserve the “quality’ of the green space (for example as a place to raise animals) without sending out a wrong message to local residents that their use of the park might cause environmental damage. There are many cultural initiatives in Bondy, ranging from a project by the town hall to preserve significant archeological remains in the centre of the town to associations which maintain cultural traditions (e.g. the Serbian association) or independent efforts to promote creative expression and production (e.g. Bulle d’ox cartoons and comics). Music has an important position in the town: “Les Petits Ecoliers Chantants de Bondy”, a choir of 8-10 year olds from diverse cultural backgrounds, has achieved international renown. Music “of the street” also plays a significant role, particularly in the cités. Bondy has produced some well-known rap and hop-hop artists, and this art form is still today seen as a very desirable – if not particularly realistic – way to “escape to celebrity” for disaffected male youth in the cités. Street art has made a visual impact in areas of the cités, particularly a set of murals painted by residents and pupils, and sponsored by the US American Embassy in Paris, in addition to numerous examples of graffiti, particularly along the banks of the canal. 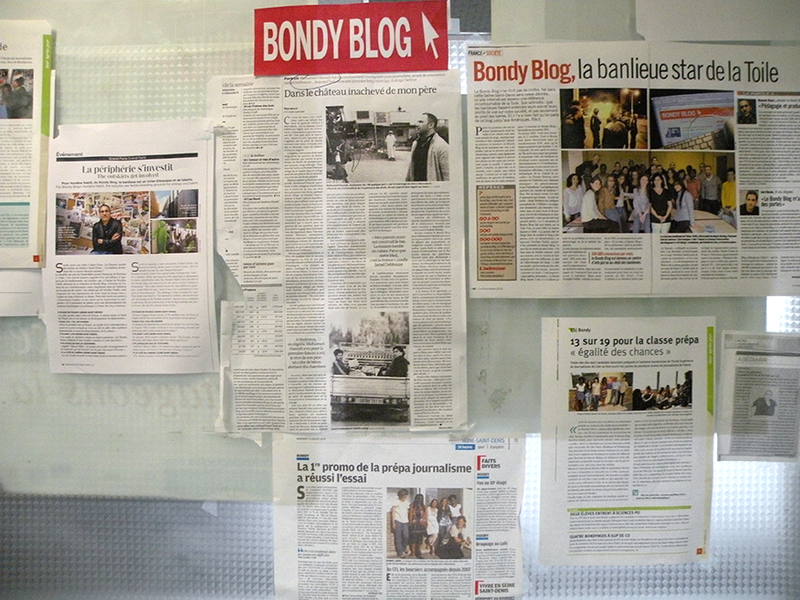 Bondy is the home of the “Bondy Blog” founded in 2005 by the Swiss “L’Hebdo” magazine at the time of the riots in the “banlieue”. 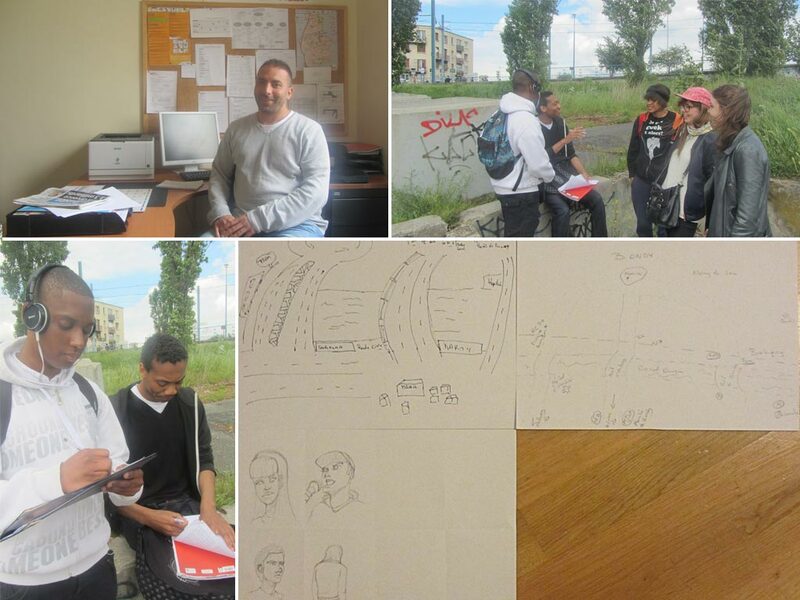 The aim of the blog was to give a voice to young people from the “popular” new housing estates in Seine-Saint-Denis. L’Hebdo practically withdrew in 2006, leaving control to the Blog association. The Blog now has a strong educational and professional network, and is well respected as a voice of the banlieue throughout France. Despite many initiatives by the town hall, and committed associations, collaborative cultural expression of identity and community still remains a challenge in such an economically, socially, culturally and demographically diverse population. Part of the identity and character of Bondy stems from its industrial past. In the south of the city, some of the large industrial sites still exist, but these are rapidly being replaced by new housing. Clearly, the early immigrant “wave” came in the fifties to fill the employment needs of post-war heavy industry, for example, Simca car production. These early immigrant families are now well established in the town, often with a strong “Bondinois” identity and network. We have met some brilliant examples of entrepreneurship, creativity and energy amongst the established immigrant community. Apparently the first “cité” housing was conceived as a “transitional phase” for young families before they moved upwards towards more ambitious properties. However, some families never “moved up” but remained marginalized and “trapped” in the rapidly deteriorating basic high-rise blocks (“barres”) of the 60s and 70s, with high levels of unemployment and poverty. Hence there followed the formation of the high-rise “ghettos”. This concept, very often undeserved, of the somewhat lawless ghetto was magnified during the 2005 riots which started in Clichy sous Bois and quickly spread to other neighbouring areas, including Bondy. The challenge is doubtlessly to remove this undesirable “ghetto” stigma of the “cités populaires” and to create a sense of unity of identity across the diversity of the town, to bridge the perceived gap between “us” and “them”. Everywhere, there is the impression that new houses are being built, both social and private housing. A tour of the town also reveals the remarkable social diversity and “mix” within the town – from the new “cités populaires” in the north (and spread through the centre and south) and the old workers housing to the affluence of the bourgeois districts. 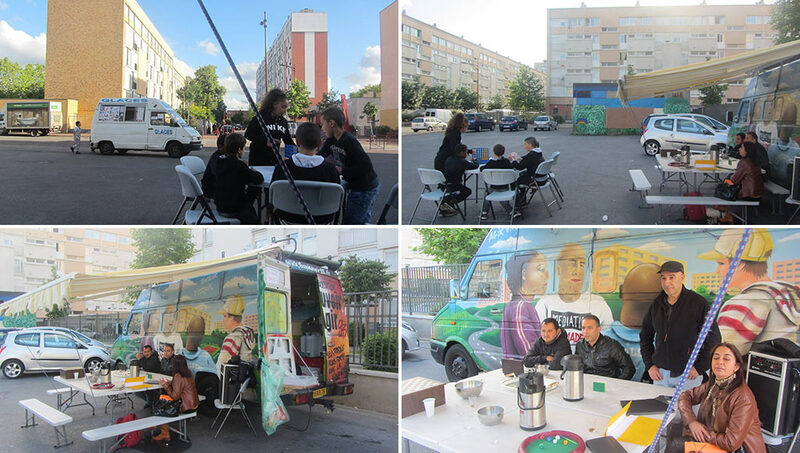 There are also many outstanding examples of cultural and community building on a public and private local – from the “médiation nomade” (bringing residents together socially in the cités), to residents’ cultural and artistic associations, to the creation of new cultural and community centres. 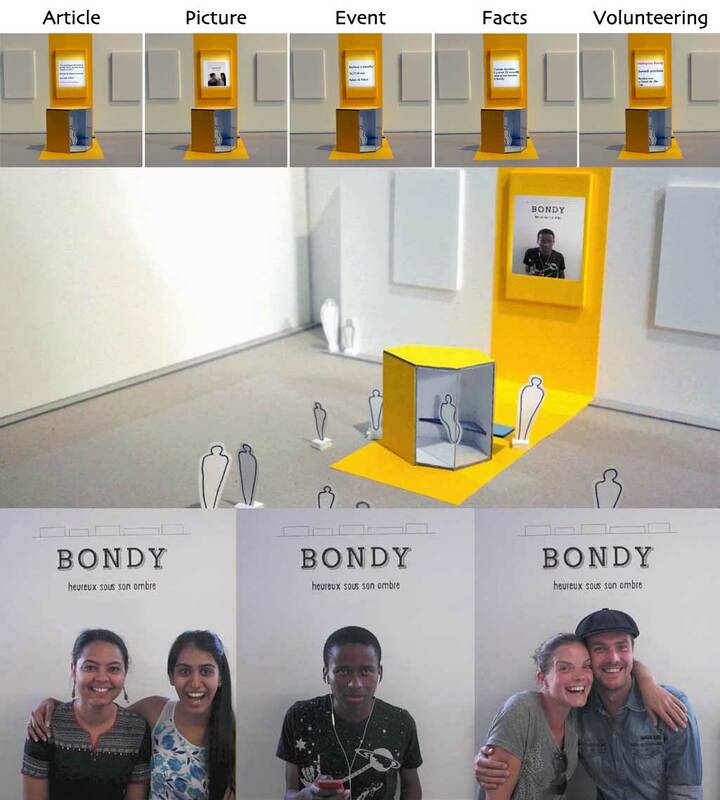 The challenge in Bondy was to create new and innovative connections across the broad social, cultural and economic diversity in Bondy, in order to improve community cohesion and inclusion, creativity and quality of life. In line with the conviction that increased international perspective heightens the innovation potential, this summer’s European Street Design Challenge featured a broad selection of international and regional teams of creative start-ups and students. As in previous years, we were very fortunate to have been supported generously by the Region of Seine-Saine-Denis, and particularly Ouafae Benslimane, Ph.D Chef de projet recherche, innovation Conseil général de la Seine-Saint-Denis, Direction de l’Aménagement et du Développement, in the months leading to the ESDC – supporting the selection of the target design area, and subsequently helping us to make connections with key figures in the area. In addition to Ouafae, Rabia Hamidi Nahar provided essential support with her in-depth knowledge of Bondy, strong links with the local community, and considerable efforts to bring us together with leading personalities – political, cultural and entrepreneurial – in the area. From the Mairie of Bondy, deputy Mayor Marion Unal provided us with a wealth of information and insight concerning urban development and planning in Bondy in advance of the Challenge, in addition to linking us with a strong local coordination network. As already stated, a team of “embedded” Strate School of Design designers spent several months before and during the ESDC, culturally and emotionally mapping the Bondy area, and working on “co-creation” theory and practice. On the evening of Wednesday, 11th June, the day before the opening of the Challenge, the participants gathered in Paris to travel to Bondy for an informational session, kindly organized at the Mairie of Bondy by Rabia Hamidi Nahar. The Mayor of Bondy, Mme Sylvine Thomassin, kindly honoured the ESDC with her presence and introduction, while guest speakers, such as local entrepreneur Youness Bourimech, and Social Centre Director Mahmoud Bourassi, provided extremely useful information about Bondy, its history, cultural, social and economic background. The session was very well received by the ESDC participants, many of whom went on to visit the Médiation Nomade, despite very uncertain transport facilities due to the train strike. The Challenge started early on the first day of the Futur en Seine festival on Thursday, 12th June. Once again, the participants met at the Gare du Nord for the travel to Bondy, although the journey was again complicated by the current train strike. Over the course of the next few hours the group visited a diverse range of areas and communities, including the banks of the Canal de l’Ourcq, the cités in the north, including the colourful market, the IRD, the incubator of entrepreneur Youness Bourimech, and the premises of Bondy Blog, with the very helpful and informative Djamel Hamidi. The busy market in the North of Bondy with its colourful, fresh products, makes you feel you are actually transported to the South of France! At the end of the tour, the participants returned to the Numa to begin the brainstorming exercises, starting with Mental and Emotional Mapping. With the definition of the Design Values, the activity at the Numa ended for the day. After the appreciative inquiry, the teams continued the concept creation, design and build process of their prototype models and presentations. Discussion and feedback is essential for the iterative development procession, and the Challenge organisers were once again expertly supported by FabLab specialist Fiona van de Geijn, with the additional expert assistance of Maarten Hendriks. At the end of the second day, the Challenge participants left the Numa at around 8pm. On the morning of the third and last day all teams worked hard to finish their prototypes and presentations. At 15:00, the final presentation of the team designs began in an excellent presentation round on the fourth floor of the Numa. The Strate team focused on a new means of communication to interest and involve young people on the street – BondyChérie. 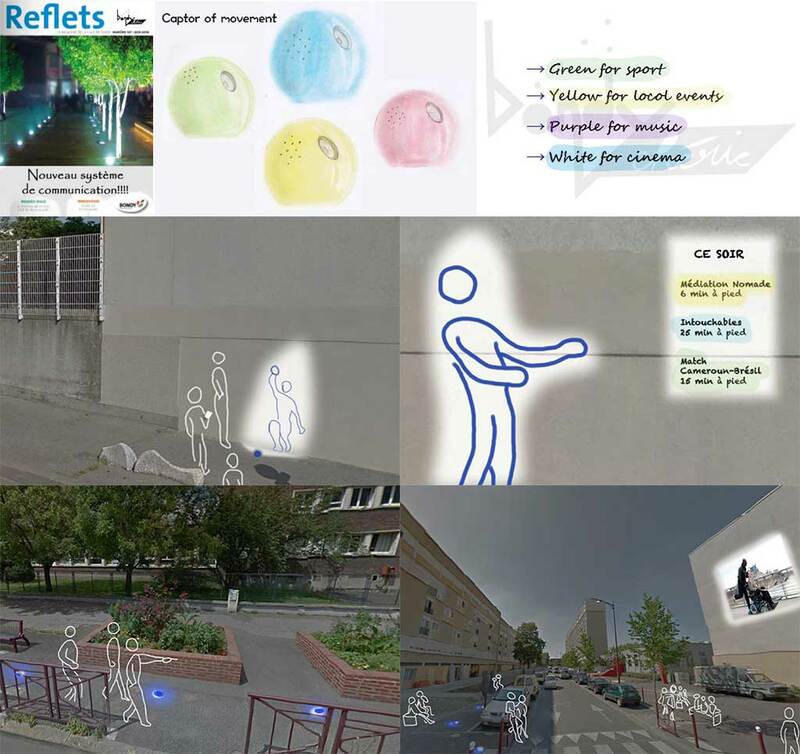 A sensor on the street would perceive and capture movement, and visually draw the attention of passers-by with a wall projection of a figure, announcing a program of possibilities for entertainment or communal activity in the town. These activities would be colour-coded – green for sport, yellow for local events, purple for music and white for cinema. After activity selection, a colour-coded path would then lead people to the chosen event. As the “perfect means” to bring people together, three open air cinemas would be created for those interested in the “cinema” option, using large-scale projections on building walls. Existing forms of cross-community news and communication, such as the “Le Reflet” magazine, would be used to launch the campaign. 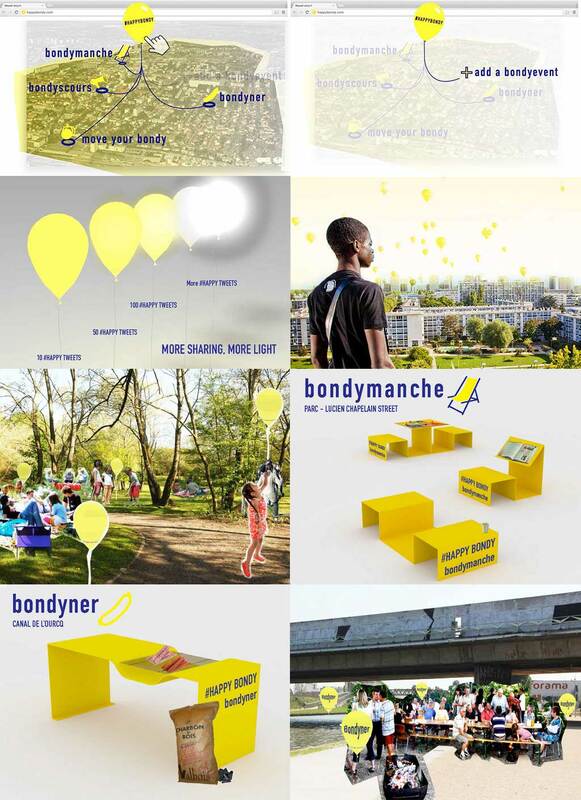 To strengthen participation and identity, large yellow balloons “Bondylloons” would be raised in the sky at the locations, where the event was taking place. As more people participated or tweeted about the event, the balloon would become brighter, attracting even more participants. 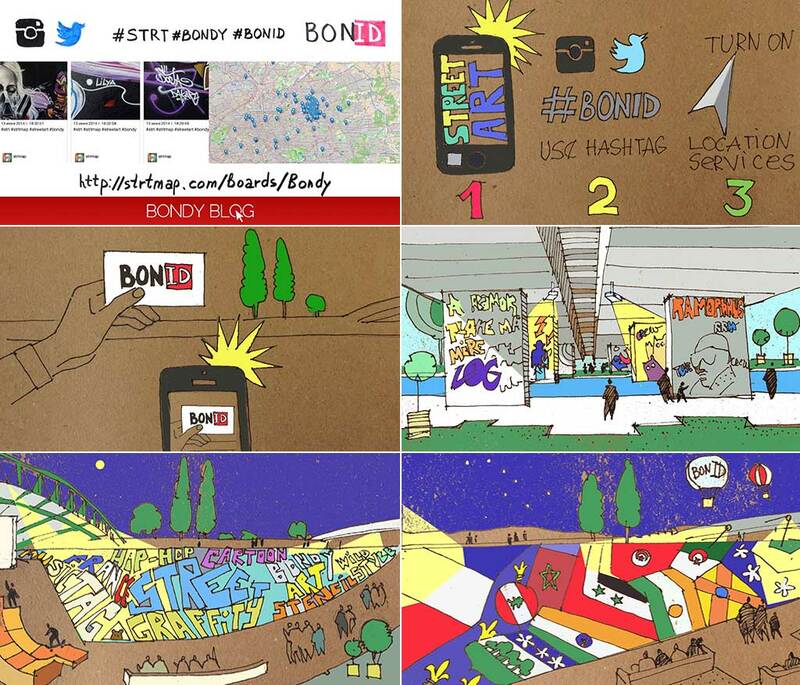 The Saint Petersburg team’s “BONID” proposal focused on such aspects as identity, street art, creative development and events. A digital media platform would offer the opportunity to store images of the city (e.g. graffiti or places of interest) to share with an international audience and to promote the branding of Bondy, leisure time and employment. In addition, an open space graffiti gallery was proposed using both physical and projected art along the canal. Not least, the redevelopment and enhancement of recreational and entertainment zones was envisioned, featuring street art projections, and light performances. The Chelsea team proposal aimed to bridge the gap between those citizens who were actively involved in the positive development of Bondy, and those who were indifferent or disinterested, through communication and joint activities. In other words, they proposed to “change the feeling, but not the identity of Bondy”. To this end, they proposed the creation of articles, images, events and volunteering activities. A simple photo booth would bring people together and act as a “trigger” to inspire further joint activities. Throughout the town, people would be drawn together under the motto “BONDY, heureux sous son ombre” to bring life to the idea that “sharing is caring”. 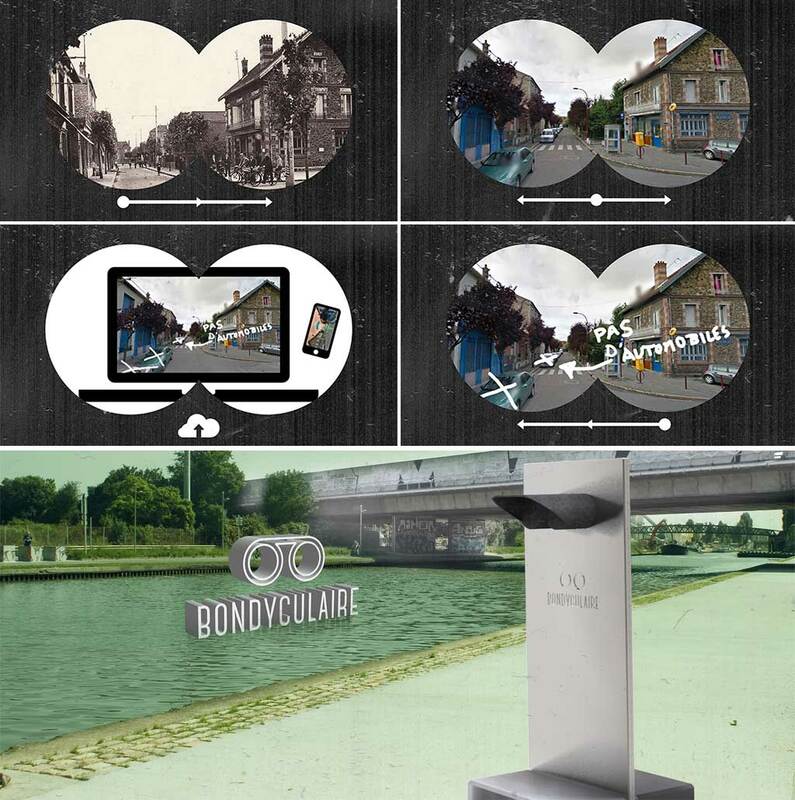 The Linz team proposed “Bondyculaire”, binoculars which enable the residents of Bondy to see the past, present and future of Bondy. Through these special binoculars, they can look more closely at their neighbourhood, revealing the potential of the town. In particular, the binoculars give them a platform, from which they can share their ideas, stories and visions of Bondy. Through an online platform, residents would be able to choose a view of the town, and use a sketching and drawing tool to visualize their own development ideas for the future. 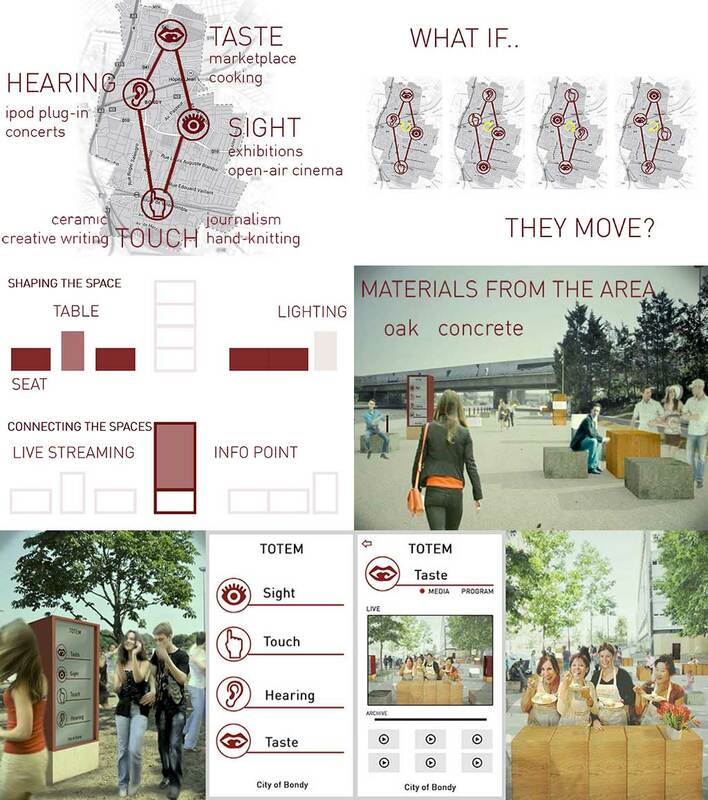 Under the title of “Sinapsis”, the Rome team proposed creating a “flow” of modules to connect people throughout the town under the following “sense” headings: Taste (market, cooking), Sight (exhibitions, cinema), Touch (ceramics, creative writing, knitting), Hearing (concerts, karaoke). These connected modules would “move” through the town, using flexible architectural units (seat, table, lighting) to shape the space and communication tools (live streaming, info points) to connect the spaces. In their “Bondy Blocs” proposal, the Ravensbourne team focused on their observation that, despite a strong street culture, Bondy has no “relevant” landmarks. They therefore proposed the creation of such a landmark, which would represent the town’s history and identity, and provide a point, where diverse groups could converge. Their proposed method was to position modular service blocks all around Bondy, which would capture the character and “uniqueness” of the different areas. Residents could also propose content for the blocks. These blocks would then be moved around the town, promoting interaction and exchange within the diverse communities. 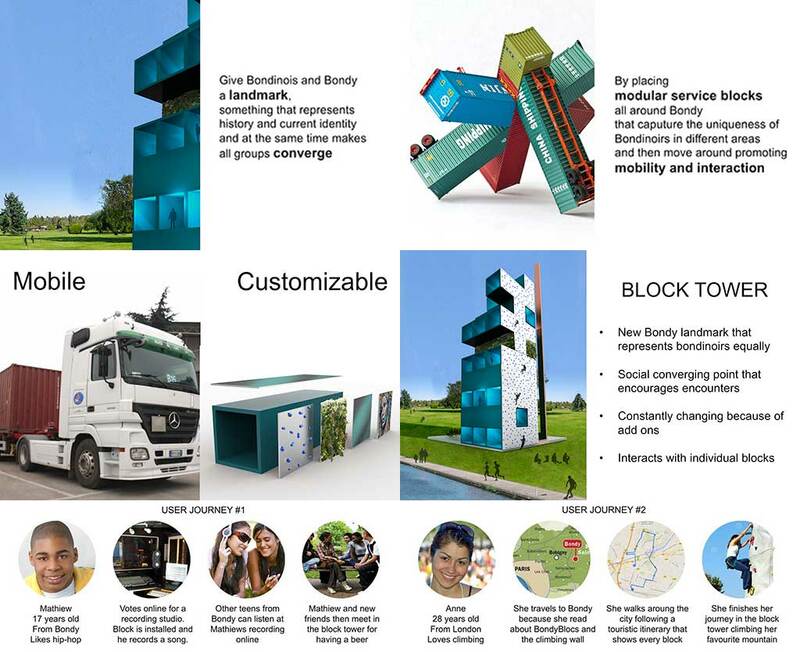 Such mobile and customizable blocks would “come together” to form a tower, a new socially convergent Bondy landmark – representing all Bondy residents equally, encouraging new encounters, constantly changing and interacting with other individual blocks. The National Design Institute of India team proposed a new form of economy based on happiness and measured in “Bonbons” (an individual unit of appreciation), which are awarded by Bondy residents to restaurants, workshops, libraries, concerts, clubs, supermarkets etc. in appreciation for specially good service and creating happiness (e.g. to restaurants, workshops, libraries, concerts, clubs, supermarkets). The restaurants, shops etc., which receive Bonbons can then trade them in for benefits from the government, and use them as a measure of their popularity. Bonbons could also be awarded to non-commercial places, like parks and public spaces – indeed anything, which contributes to the happiness of the citizens. In this way, local government could identify positive areas for development. 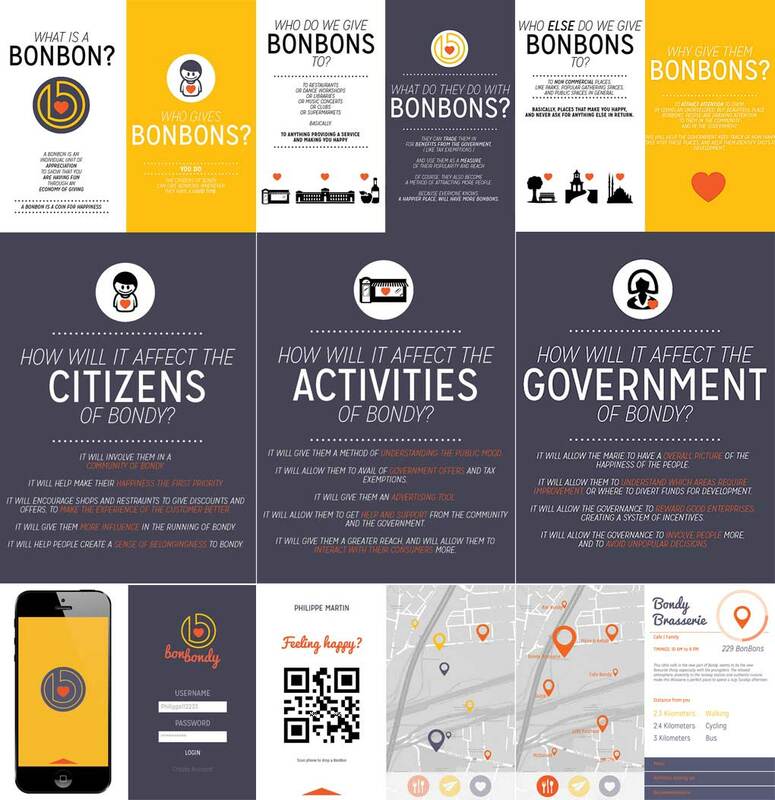 The Bonbondy service would run on a digital platform, allowing easy and targeted allocation of the citizens Bonbons. The Bonbon initiative would therefore “bring together” the fragmented positive aspects of the town and unite the diverse cultures and communities of Bondy. A sense of a unified community, with happiness a priority, would be created for the citizens, while local services and local government would be helped in understanding the “public mood” and needs of the citizens. Immediately following the team presentations, the international jury met to judge the design propositions on the basis of the following criteria: innovative, scalable, authentic, socially cohesive, feasible, sustainable. The awards were presented the following day in the prestigious Conservatoire National des Arts et Métiers, Paris.